This special Refueled series is one single subject, photographer, craftsman or artist. A modern take on the printed paraphernalia of publisher Chris Brown's youth. The faded pages and colors of LIFE magazine. The satirical tone of MAD. The low-fi quality of comics. The rebellious feel of the 60’s and early 70’s. The size of vintage scout manuals and Stuckey’s road trip souvenir activity books. Limited edition of 100 copies, signed & numbered, 7" x 7" linen hardbound book. Consist of mixed medium illustrations inspired by publisher Chris Brown's trips to the small, west Texas town of Marfa. A very personal vision. Pencil/marker drawings, watercolors and wax stick sketches curated from a number of notebooks and road journals. Each cover will be stamped with a hand-cut woodblock labyrinth design (a take on a hawk's eye view of the nomadic campground El Cosmico) and wrapped in matte slip cover. Illustrations printed on 100 lb. premium matte stock. Printed in the U.S.
Chris Brown came of age in the "cultural decade" of the 1960's. His influences from that period - the music, the style, the art and media, all play a large role in his publication Refueled, whether obvious to the reader or not. Brown created his first magazine when he was eight years old. From those sheets of typing paper sprang a vision inspired by the large format photos of LIFE, the satirical vibe of MAD, and the people and times that surrounded him. From the beginning, Brown saw issues of Refueled more as personal journals rather than a magazine. Contained in its pages today are the people and subjects that inspire Brown - meaningful enough that he feels almost a obligation to share them with the world. With Refueled, Brown is providing us not only a window into great culture, but a peek into one man's personal quest to make media itself an art form. Brown has spoken about indie publishing through prestigious events such as TEDx and HOW Design Live. He appears in the Netflix exclusive documentary "Making of the American Man", and contributed to the book "Men and Style; Essays, Interviews and Considerations" by David Coggins. Interviews, Podcast, Collaborations, Events & Films. 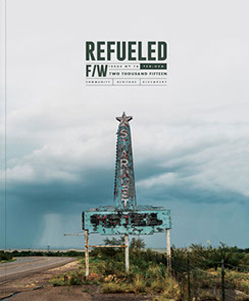 Refueled magazine is an independent publication founded by designer Chris Brown. 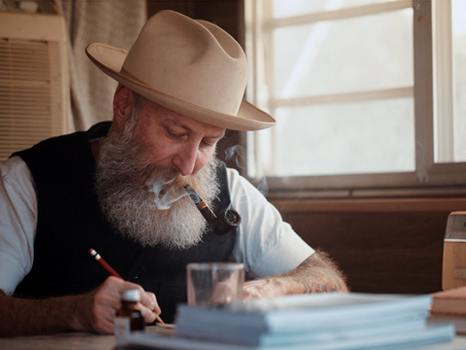 We sat down with him at an old hardware store in Denton to talk shop on philosophies of fashion, the pursuit of creativity, and the excitement of starting something that is all your own. Chris Brown, the man behind Refueled magazine, is every bit as interesting as his publication suggests. He’s a man who values tradition, adventure, rye whisky, beatnik literature, good music, and, of course, great beards. In other words: a man after our own hearts. We recently asked him a series of random questions after spending a few hours with him roaming the property of his good friend Jason Lee. Join Filson for a evening with Chris Brown, the publisher of Refueled magazine and steward of American culture. Come out for BBQ, whiskey and Brown's curated collection of Filson camp favorites. On Sunday, October 2, 2016, actor, photographer, and Denton resident Jason Lee will debut his Refueled One Series / Vol.01, Instant Film book, followed by an audience Q&A with Lee and Refueled publisher Chris Brown. Patrick Tobin of The Impossible Project, the only company in the world that manufactures original format instant film, will monitor the keynote. How Did Your Father Dress? "I remember his raw selvage Levi's jeans. He always wore really great chambray shirts and bandanas, and white t-shirts. Very Classic. Red Wing boots and cowboy hats, I mean - I dress like that today, so I know where it comes from. My father always wore a Stetson. As a child in the early sixties, I have great memories of trying on his beige Royal Stetson while he was at work in the oil refineries. It was sweat and smoke stained from days in the garden, and nights around an open fire during frequent weekend camping trips in the piney woods of southeast Texas. It smelled like him and gave me comfort in wearing it. I own that hat today." - Chris Brown, Refueled magazine publisher. "Men and Style; Essays, Interviews and Considerations" by David Coggins. Chris Brown of Refueled magazine talks about his beautiful quarterly publication, which is all about community, heritage, and discovery. In the interview, Brown chats about the importance of print publications as they fit into the context of truly experiencing the stories and art we consume. Brown also shares about the balance between doing what fulfills us creatively and focusing solely on what the audience wants or needs, how successfully selling a neighborhood newspaper at a very young age cemented his love for storytelling, and why he has taken Refueled in a slightly different direction this year. This highly anticipated film, from director Gregory Caruso, draws its power from intimate conversations with over 35 tastemakers and designers who have defined what classic masculinity looks like today, and how they feel it must be produced. From Los Angeles to New York and everywhere in between, these cultural trendsetters shed light on the modern age of American men’s style, the value of American-made goods—and how one cannot exist without the other. © 2017 Refueled. All Rights Reserved / Contributing photographers: C. Quinton Haider, Jason Lee & Rob Martinez.